It’s been an exciting week of news and updates from the world’s biggest online players. Here’s a summary and what it may mean to you. Zuckerberg could soon be challenging the mighty Google with talks of launching Facebook Search. Yes, that’s right. Facebook will soon be entering the search engine market. But not as your typical search engine. Facebook search is all about providing answers instead of presenting search results. Want to know whom among your Facebook friends have been to that new cafe you’ve always wanted to visit? Facebook search. Want to know which friends work where? Facebook search. All these information are found inside Facebook behind a wall Google can’t access. Goldmine. You can no longer ignore Facebook. You need to get personal and engage in meaningful conversations with your fans. You need to address customer issues and complaints pretty quickly because they spread like wildfire on social media. You need a social media strategy. If you manage a Facebook Page, the recent app update allows you to create Promoted Posts right from your mobile phone. Very handy if you’re a retailer: simply take a photo with your iPhone or iPad, create a post, promote it and pay via Paypal or credit card in one easy step. It seems they’re all copying each other. 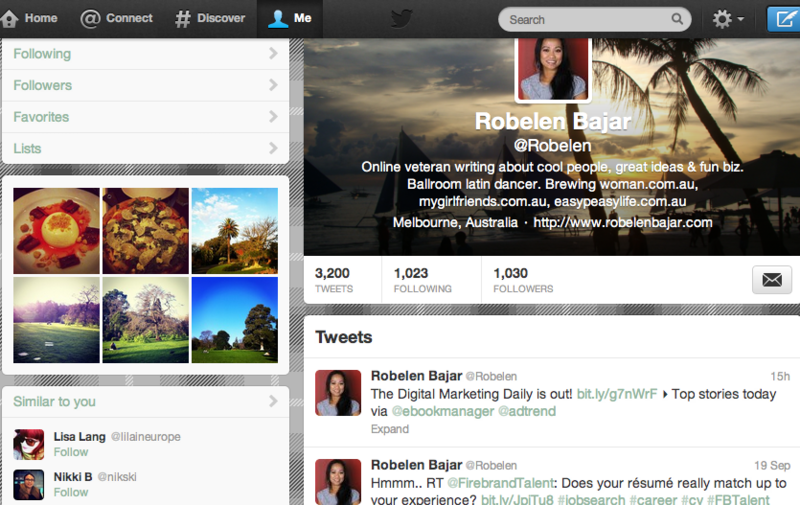 Much like the Facebook cover page, you can now upload a header image which appears just above your tweets. It’s all about focusing on profile pages giving you more opportunities to express who you are and what you stand for as an individual or as a business. After the demise of Google Wave and the somewhat barren land of Google+, it’s not surprising that Google is often accused of creating ghost towns. However, it’s recent acquisition of photo app Snapseed shows Google is serious about creating a lively community of photo-sharing folks much like Facebook. So, it looks like Google+ is here to stay. For now. This week we saw Google change its search algorithm to give users greater diversity in search results. The algorithm change means that there may be less search results presented from the same domain. The search term “Robelen Bajar” used to show 4500+ search results, mostly coming from a handful of domains. With the new update, there are now only ~1370 search results showing a variety of sources. That’s great news for users. What about your SEO? Better check with your SEO guy.